SMN Barka is an IWPP plant situated at Barka. The site is approximately 50 km northwest of Muscat, Oman. Also popularly known as Barka II / Barka Phase 2, the design net rated power output of the facility in a combined cycle mode is 678 MW and 363 MW in open cycle. The water production capacity is about 26.4 MIGD or 120,000 m³/day. The facility entered into full commercial operation on 15 November 2009 and commenced the fifteen-year PWPA, guaranteeing the sale of its electricity and potable water capacity and production to OPWP. The power plant comprises three V 94.2 Rev 6 dual fuel combustion turbines (Siemens design manufactured by AnsaldoEnergia, Italy), three supplementary fuel fired heat recovery steam generators and two Siemens condensing steam turbines, along with ancillary equipment required for operation of the power plant, which give the plant a high operational flexibility. The individual V94.2 gas turbines hot exhaust gases directly flow into naturally circulated heat recovery steam generators, generating steam at two pressure levels: high pressure steam at 85 bar and low pressure steam at 7 bar. The high pressure steam from each of the heat recovery steam generators is combined in a common header and passes to one of the two steam turbines as is low pressure steam. 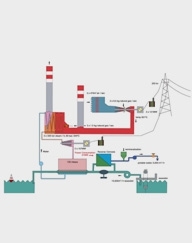 The facility is equipped with bypass stacks allowing operation of each combustion turbine in open cycle if required. The SMN Barka Plant is designed for black start operation by means of diesel generators which are capable of starting the plant in use of grid failure. Desalination for water production involves a sea water reverse osmosis desalination plant with a contracted capacity of 26.4 MIGD or 5,000 m3/hour of water. The reverse osmosis system comprises of 14 trains in the first pass and 7 trains in the second pass. Unlike "natural" osmosis, which facilitates solvent migration so that concentrations are even on both sides of a membrane, reverse osmosis involves forcing seawater at high pressure through a membrane that is almost impervious to suspended minerals. In the end pure water is left on one side and highly concentrated brine on the other. Reverse osmosis provides SMN Barka the flexibility, in certain cases, to produce desalinated water even when the power production is not operational, using power from the electricity grid. The power plant operates on natural gas as primary fuel with fuel oil as back-up. The plant is connected to the gas transmission infrastructure owned by MOG, to the existing water transmission system owned and operated by PAEW and finally to the main interconnected transmission system at 220 kV which is owned by OETC. The auxiliary power for the Plant is derived from the Plant's internal electrical system with back up from the grid. The equipment and facilities required for the operation, testing, maintenance and repair of the equipment (for example control room, laboratory, stores, workshop, etc.) are available at site. SMN Barka has contracted all operations and maintenance activities ("O&M") of the power station to Suez Tractebel Operations and Maintenance Oman ("STOMO").